* Ovechkin scored the 610th and 611th goals of his NHL career to leapfrog Bobby Hull (610) for sole possession of 17th place on the League’s all-time list. Coincidentally, when Ovechkin captured his seventh career Maurice “Rocket” Richard Trophy in 2017-18, he joined Hull (also 7x, all w/ CHI) as the only players in NHL history to finish atop the League’s goal-scoring race seven times. * Ovechkin recorded his first multi-goal game of the 2018-19 season and the 121st such outing of his NHL career, tops among active players. He moved into a tie with Hull and Jari Kurri for the 14th-most multi-goal games in NHL history. * Washington has scored 18 goals across three games to open the 2018-19 campaign, establishing a new franchise record for most through the first three games of a season (previously 17 in 1988-89). * Since 1927-28, the Stanley Cup champion improved to 51-31-6 in the first regular-season meeting between Stanley Cup finalists (runner-up: 32-48-8), including a 5-1-0 mark since 2013-14 when the schedule matrix was changed to include head-to-head matchups between all teams. * The reigning champion has won each of the past four rematches. Defending champions last won four straight rematches from 1957-58 to 1960-61 when the Canadiens did so during their NHL-record run of five consecutive Cups. * Voracek ranked fourth in the NHL with 65 assists in 2017-18, trailing only Connor McDavid (67), Blake Wheeler (68), and teammate Claude Giroux (68). Voracek and Giroux became the first pair of teammates to each record at least 65 assists in a season since Evgeni Malkin and Sidney Crosby in 2008-09 (w/ PIT). Six of eight days in the 2018-19 season have seen at least one player record four or more points in a game. In addition, six of eight days have also seen one team score seven or more goals in a game. 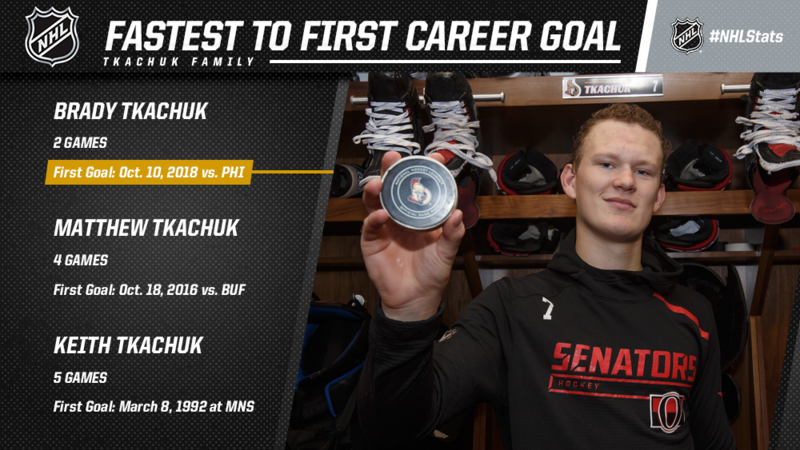 * Tkachuk (19 years, 24 days) became the fourth-youngest player in franchise history to score the first goal of his NHL career, behind Alexandre Daigle on Oct. 9, 1993 at STL (18 years, 244 days), Pavol Demitra on Oct. 9, 1993 at STL (18 years, 314 days) and Radek Bonk on Jan. 27, 1995 at PIT (19 years, 18 days). He also became the eighth teenager in franchise history to record at least three points in a game and first since Erik Karlsson on March 27, 2010 vs. FLA (0-3—3). * Raanta owns a career save percentage of .922, tied for the third-highest among goaltenders to appear in at least 100 games since 1955-56 when shots on goal became an official NHL statistic. * Both clubs set franchise records for wins and points in 2017-18, with the Predators earning the Presidents’ Trophy for the first time in franchise history. 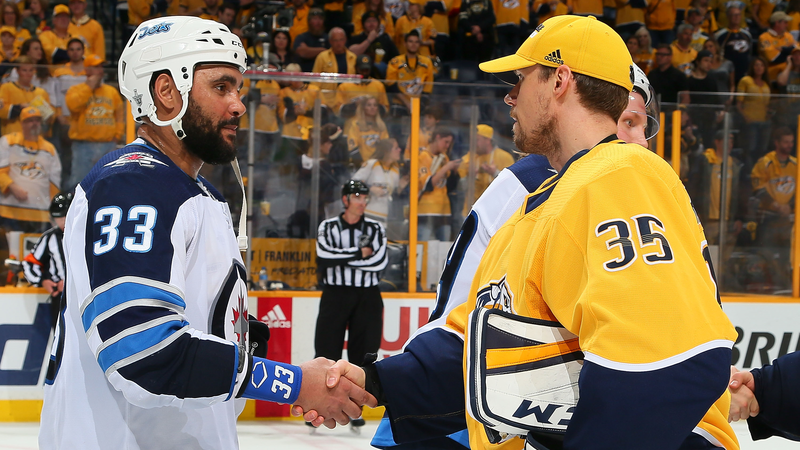 Nashville held the edge in head-to-head regular season contests last season with a 3-1-1 record (WPG: 2-3-0). * In the Second Round of the 2018 Stanley Cup Playoffs, the teams battled in a back-and-forth series before Mark Scheifele (2-0—2) and Connor Hellebuyck (36 saves) propelled the Jets to a 5-1 victory in Game 7. Scheifele was one of the breakout stars of the playoffs with 14-6—20 in 17 games – only Conn Smythe Trophy winner Alex Ovechkin (15 G in 24 GP) scored more postseason goals last season. * The Devils will host the defending Stanley Cup champion Capitals in the team’s first regular-season contest at Prudential Center this season (they were also the home team of record in the Global Series game on Oct. 6). Kyle Palmieri, who has topped the 20-goal mark in each of the past three seasons, and Travis Zajac, the longest tenured Devils skater in his 13th season with the club, contributed multi-goal outings in their season-opening game. * The Oilers visit the Bruins in Edmonton’s first regular-season game on North American soil in 2018-19. Connor McDavid opened the campaign with a pair of assists in Gothenburg, as the 21-year-old forward looks to become the first player to win the Art Ross Trophy three straight seasons since Jaromir Jagr did so for four consecutive campaigns from 1997-98 to 2000-01. * Maple Leafs forward Auston Matthews has started the 2018-19 season with a four-game point/goal streak (7-3—10 in 4 GP). His teammate, John Tavares, has contributed 6-0—6 through his first four games of the season including multiple goals in back-to-back contests. They are the first set of teammates to each score six or more goals through a team’s first four games of a season since Wayne Gretzky (6) and Luc Robitaille (6) with the Kings in 1988-89. 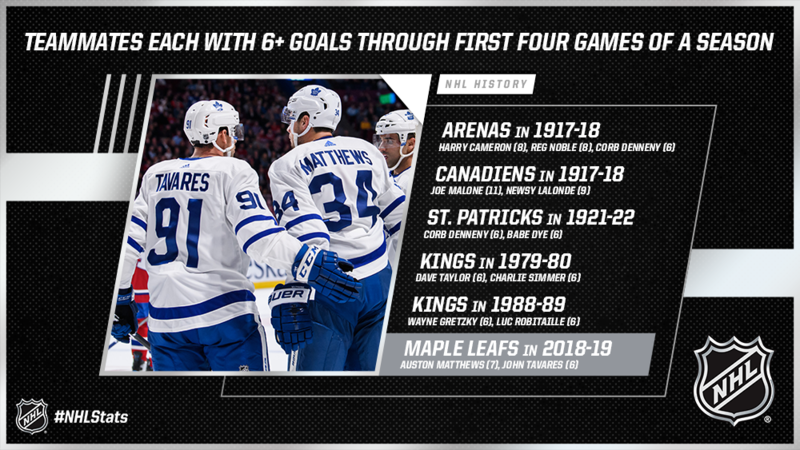 * Maple Leafs defenseman Morgan Rielly has recorded 2-8—10 in Toronto’s first four games to become the third defenseman in NHL history to record 10+ points through his team’s first four games of a season. The others: Harry Cameron in 1917-18 (8-6—14 w/ TAN) and Pat Stapleton in 1968-69 (1-9—10 w/ CHI). The NHL record for most points by a defenseman through his team’s first five games belongs to Cameron (9-6—15 in 5 GP in 1917-18). The most points by a defenseman through his team’s first five games of a season in the modern era (since 1943-44) is 11, achieved by eight-time Norris Trophy winner Bobby Orr in 1973-74 (2-9—11 in 5 GP). * A Hart Trophy finalist in 2017-18 after notching career highs in goals (39), assists (58) and points (97), Avalanche forward Nathan MacKinnon has started the 2018-19 campaign with a goal in each of his first three games. Only three players in franchise history have started the season with at least one goal in each of the team’s opening four contests: Mats Sundin (5 GP in 1992-93), Michel Goulet (4 GP in 1983-84) and John Mitchell (4 GP in 2015-16). * The Blackhawks have required overtime in each of their first three games to begin the 2018-19 season (2-0-1). The only team to begin a season with four overtime games was the 1997-98 Rangers – all four of those contests ended in a tie. No team has ever begun a season with five consecutive overtime games.